This is my signature recipe for creating a deliciously vegan and yet easy-to-make alternative to fish. The filets are coated with a plain or seasoned dry breading of your choice and then baked. To add a seafood flavor, try incorporating some ground or flaked kelp, dulse or nori seaweed into the breading mixture. To spice things up, add Cajun or Southwestern seasonings to the breading – the possibilities of seasoning combinations are endless. For those who are gluten-free, simply use gluten-free bread crumbs. Or try coating the filets with crushed nuts. Crushed macadamia nuts or pecans make an excellent coating; or combine breadcrumbs and crushed nuts together. You can also create “mock fish sticks” which are very popular with children. After baking, the filets are finished by browning in the skillet in a small amount of cooking oil. 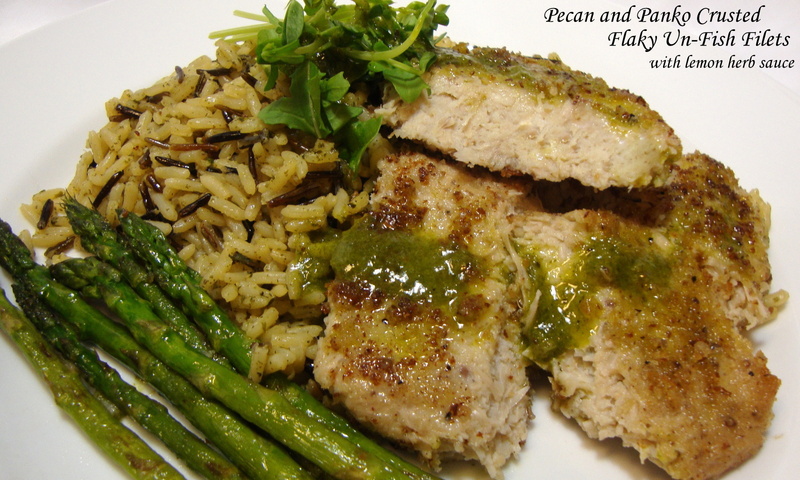 Canned green jackfruit provides the amazingly moist and flaky texture in these filets. It can be found in Indian and Asian markets. Look for the label “Green Jackfruit” or “Young Green Jackfruit” and be sure that it’s packed in water or brine, not syrup. You may notice cans of ripe jackfruit stocked nearby but don’t be tempted to substitute as it is very sweet when ripe and packed in sugar syrup. Slice the tofu into 2 slabs and drain on paper towels or a clean, lint-free dish towel. Gently press the tofu while draining to encourage as much liquid as possible to transfer to the towel(s). Drain the liquid from the cans of jackfruit and rinse the fruit thoroughly (especially if it was packed in brine) and drain in a colander. With a sharp knife, remove the tough core from each chunk of jackfruit and discard. Break the chunks apart with your fingers and remove the soft seeds and discard. 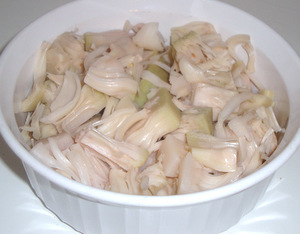 Green Jackfruit pulp with core and seeds removed. Wrap the stringy pulp in a paper towel or clean kitchen towel and squeeze to remove any excess remaining water. This will yield about 6 to 7 ounces of jackfruit pulp. Add the chunks of jackfruit to a food processor and pulse several times to shred into flakes. Do not purée the fruit. Transfer to a mixing bowl and set aside. Add the tofu to the food processor with the remaining ingredients and process into a paste. Add the paste to the shredded jackfruit and mix well. Form filet shapes from the mixture no more than ½-inch thick (4 filets). Add the bread crumbs or coating of your choice to a bowl or a plate. Press the filets into the crumbs/coating and place the breaded filets onto a baking sheet lined with parchment paper. Bake for 30 minutes, gently turning the filets after 15 minutes. To finish the filets, add just enough oil to a large skillet to cover the bottom and place over medium heat. Pan-sear the filets in the oil until golden brown on each side and transfer to a plate lined with a paper towel. Serve immediately with a squeeze of lemon or the garnish or sauce of your choice.